The piece begins with applause for the Senate’s decision last December to reject the the UN Convention on the Rights of Persons With Disabilities, before critiquing a trend sustained by some legal scholars, called legal transnationalism, which favors enshrining articulated international norms of justice in national judiciaries. The punchline can be found in the byline. The article was coauthored by Jon Kyl, John Fonte, and — prepare to laugh, those in the know — Douglas Feith. Not simply some sort of detached scholar, devoted professional, or principled activist, the latter author would appear to have a direct stake in the outcome of the global debate on legal transnationalism given the clear threat posed to him by potential criminal charges. 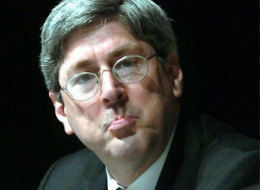 Former undersecretary of defense for policy in the Bush administration, Feith is often remembered for heading a group prior to the Iraq War which “developed, produced, and then disseminated” intelligence assessments contradicting the CIA’s conclusions. The group, called the Office of Special Plans, attempted to allege a nonexistent link between Al-Qaeda and Saddam Hussein’s regime. The Defense Department’s inspector general subsequently issued a report on Feith’s group finding it to have engaged in “inappropriate” intelligence activities, although none were in violation of any DOD directives or American law. But Feith the multitasker apparently found it difficult to shake an aura of criminality. Relevant to the Foreign Affairs article of interest, he also happens to be one of theBush Six, a group of the aforementioned administration’s legal advisers subject to a criminal investigation initiated in 2009 by a court in Spain for their alleged role in enabling and abetting the torture of terrorism suspects. While anxious about the fate of Spain’s relationship with the U.S., in 2009 acting Spanish Foreign Minister Angel Losada confirmed “that the National Court had broad jurisdiction for universal justice” and though “the government was not supportive of the universal jurisdiction case, it had no authority” in the matter. And so the case continued until April 13, 2011 when presiding Judge Eloy Velasco “temporarily stayed” the case in Spain “for it to be continued” by the U.S. Justice department. It remains so to this day. Why exactly is this fortunate? Because unilateral judicial action on laws not subject to sovereign, democratic review was stymied, according to the argument laid out in the piece. But one can’t help but wonder if Feith’s sensation of fortune, brought on by the nonsuccesses of transnationalism, is somehow linked to the movement’s present failure to investigate his alleged association with a policy of torture. Then, consider this article the disclaimer Foreign Affairs forgot. Michael Youhana is a recent NYU graduate whose studies were in Politics, Philosophy, and Economics with a focus on US Foreign policy. His writing has been featured in The Nation and The Jerusalem Report and on AntiWar.com, PolicyMic, and The Moderate Voice.